Prayer: Prayer is a two way conversation with God. When we pray, we share the good and the bad in our lives with Him. We also, open our hearts to listen to what God has to say. When we keep our hearts open and keep the conversation going, we allow Jesus to abide in us, and when that happens we want nothing more than to follow Him all the days of our lives. Digging into God’s word: When we dig into the Bible, we can feel the Holy Spirit breathing life into our lives. 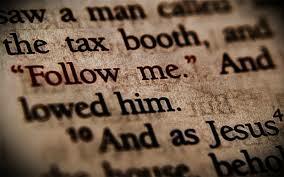 We learn about Jesus, but most importantly, we learn how to follow Jesus. We learn what it means to be a Christian. When we read the Bible, something magical happens. It transforms our lives. The words sink into our hearts and our souls and we become disciples of Jesus. Sacrifice: To follow Jesus, scripture says that we must deny ourselves. That means that we must put the will of God before our own. Scripture says that we are not to be of the world. 1 John 2:15 says not to love anything in the world. We get so caught up in worldly things that we forget Jesus. Jesus said that we must sell our possessions and give to the poor. I believe that Jesus is asking us to live simple lives, so that we will be able to give to those in need. I also, believe that Jesus wants us to live simply so we remember that He is the most important thing. We may be asked to leave our families, our homes, our livelihoods in order to follow Jesus. Jesus, Himself had no home. What is Jesus asking you to sacrifice in order to follow Him? 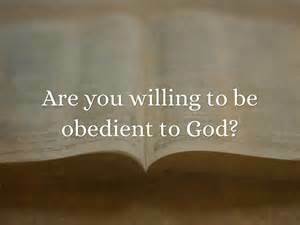 Obedience: In order to follow Jesus, we must obey Him, no matter the cost. Obedience is hard. We want to live one way, but Jesus is calling us to live a completely different way. If we want to follow Jesus, we MUST obey what He says. There are times when Jesus may call us into a lifestyle that we would never think of to fulfill His purpose. Be willing to obey. In my own life, Jesus has called me to follow Him in this season of my life as a single woman. I knew a few years after my divorce in 2000 that I was meant to be single. I have had some well intentioned shoves to meet someone, but I am meant to be single. I felt confirmation in that calling about 3 months ago when I read that according to the Catholic Church, being single can be a vocation. YES!!! I knew it! Not everyone is meant to be married. There are those of us who feel called to follow Jesus as single men and women. Along with prayer and studying the Bible, I follow Jesus through celibacy, living a simple life, and writing this blog. As a Providence Associate I am called to living a life of Love, Mercy, and Justice in my sphere of influence. My relationship with Jesus is my EVERYTHING! There is nothing more important than Jesus. There can’t be if we choose to be His followers. Jesus is calling you NOW to follow Him. He wants your heart. He wants your sacrifice. He wants your obedience. Are you willing to walk away from the world in order to follow Him today? I know how hard it can be to share the Gospel with others. I am an introvert. I have social anxieties and can be socially awkward. It is extremely hard for me to share my faith with unbelievers. That is one of the reasons I write this blog. I love to write and it is so much easier to share my faith with the world through this blog than it is face to face. One of the biggest excuses for not sharing our faith is, “what if they don’t listen to me?” God tells us that we are to share the Gospel whether they listen or not. It is not up to us who we share with. We should not to choose who to share with simply because someone looks more receptive than someone else. That isn’t the way it works. God tells us to share the Good News of Jesus in obedience to Him and leave the outcome to Him. 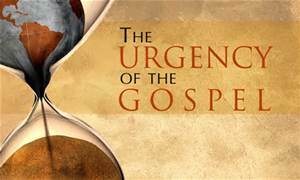 There is an urgency in sharing the Good News in these days of chaos and evil. If we know the Truth of Jesus and we keep it to ourselves, then we are responsible for the sin of our brothers and sisters. If we do not warn them of their sin and point them to Jesus, then we will be as guilty as they are. They may not listen. That is their choice. At least you will have obeyed the voice of the Father and warned them of their sinful ways. It is never up to us who we share our faith with. God wishes that NONE should perish (2 Peter 3:9). We have a responsibility to share the Gospel with those in our sphere of influence who do not have a personal relationship with Christ. This is our God given purpose. Challenge: Share the Good News of Jesus with one person each day. Share what God lays on your heart. 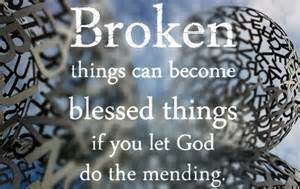 Even if your shaking in your shoes, God will bless your obedience and maybe because of your obedience a life will be saved. Have you heard the call of the Lord on your life? Have you ignored the call because of fear, inconvenience or it is simply to much of a sacrifice? I have. I admit that my fear and lack of faith in God’s ability to provide has kept me living in mediocrity. 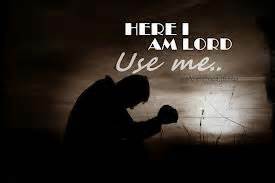 Oh sure, I may have said, “send me” but inside I was hoping that God would say, “that’s okay, I’m just kidding.” So, I have remained living in disobedience, frustration and mediocrity. I yell at God to give me an opportunity to be used in full-time ministry and then when He does, I run the other way and don’t look back. I blame God, but really it is all on me. I sabotage my own opportunities by living in fear and refusing to trust in my heavenly Father. God has been working on me. He has been pruning my character and getting me ready to serve Him full-time. He has lovingly brought me to the place where I am willing to step out and live as George Mueller and countless other missionaries, in complete dependence on God to provide. Am I at a place in my faith journey where I am able to give up my reliance on a stable paycheck, the security of knowing how the bills will get paid or how we will be fed? Am I at a place in my faith journey where I am willing to move ahead, even if it means leaving family behind because they may not approve of what I am doing? Can I give up material possessions and conveniences to serve God and trust Him to provide what we need? God has been working on my faith and again today, asked me these same questions through a Facebook post on a friend’s page. Am I ready to step out in complete faith? Are you ready to answer the call that God has placed on your life, regardless of the sacrifices? 1. Missionary Spirit- He was willing to follow God wherever and whenever God led. Mr. Mueller was a pastor, opened orphan houses that provided homes for thousands of children, and he traveled in his later years as an evangelist. He never had a “stable” income, trusting God for provision. 2. Renunciation Of Self- He was always analyzing his spirit for any signs of the flesh coming through. He was diligent about putting his agenda aside and focusing on what God wanted him to do. 3. Taking Counsel Of God- Mr. Mueller always consulted God first. 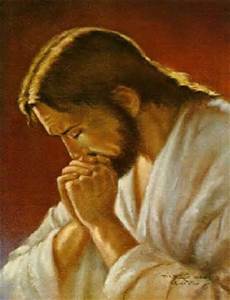 In every situation, when a decision needed to be made, when provisions were needed, George was on his knees in prayer, asking God to reveal His will. 4. Humble And Childlike Temper- George was a role model of humility. He never thought of himself first, always thinking of the other person. He was known for his patience, love, kindness and compassion. 5. Cutting Loose From Man- Mr. Mueller did not ask any man for financial or any other type of support. He went to God alone to provide what they needed. He trusted God to work in the hearts of those He chose to provide for the needs of the ministry. 6. Satisfaction In The Word- He knew that the Bible was the Word of God. He found peace in knowing that God provided His Word as a guide to daily living. 7. Thorough Bible Study- He knew the Word inside and out. He was a lifetime student of God’s Word. He not only studied the Word, but applied what he read to his life. 8. Freedom From Human Control- George did not allow himself to be controlled or manipulated by humans. He did not seek the approval of humans, only the approval of God. 9. Use Of Opportunity: Approaching Others As To Matters Of Salvation- George was always open to the leading of the Holy Spirit. He was always open to the opportunities to reach out to others with the Gospel of Jesus. 10. Knowledge Of The Second Coming- Mr. Mueller was aware that Jesus is going to return at some point. Every one of of his ministries was used to prepare the world for the second coming of Jesus. 11. Waiting On God For A Message- Mr. Mueller never acted of his own accord. He waited on God in all things. There were many times when God’s answer did not come until the very last minute. He never acted in disbelief. He always trusted God for an answer to his prayers. 12. Submission To The Authority Of The Word- God’s Word was the final authority in everything that Mr. Mueller did. He did not make any decisions without seeking God’s will through the Word. He would research the Bible inside and out until he found what God’s will was on a particular issue. 13. Surrender Of All Earthly Possessions- He did not consider anything he owned as his. It ALL belonged to God. If someone was in need of something that he had, he would give it freely. 14. Habit Of Secret Prayer- George spent hours on his knees in prayer. He prayed in isolation, using the time to focus on God and discern God’s will in daily matters. 15. Guarding Of His Testimony- George was very careful to make sure his reputation and testimony were not tarnished by sin. His daily goal was to live a righteous life as an example for others. He did not want anything that he did to become an obstacle in another person’s walk with God. 16. Organizing Of His Work- Mr. Mueller always maintained that the ministries he ran were not his, but God’s. If they ever ceased to glorify God, he would have closed them down immediately. 17. Sympathy With Orphans- Mr. Mueller had a God-given passion for orphans. I believe that this passion was extended to those who were “orphans” in their sin, as well as, children. God does not wish for any to be lost. George was a shepherd, in the truest definition of the word. 18. Allowing Himself To Be Molded By The Potter- He never stopped being a student of God’s. He was always seeking God’s guidance in matters of the heart. He was always seeking a revealing of any characteristics that were not Christ-like. Even in his later years, he still allowed God to mold his character. 19. Simple Living- George lived very simply. He only prayed for his basic needs to be met. If God blessed him with a surplus in resources, he would give the surplus away. 20. Giving Generously- He gave generously of any surplus resources he had. He believed in giving to those in need and did without himself, so that others would not have to suffer. 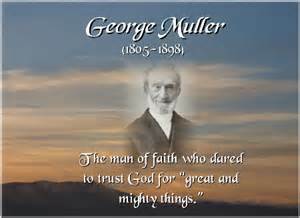 There is so much that we can learn from George Mueller. I really try to live these characteristics out in my daily life. It is an ongoing journey and I don’t always live up to the standard Mr. Mueller set. I encourage you to read the book. It would be a great book for a group Bible- study. There is so much more wisdom and guidance from the life of George Mueller in the book. READ IT!! !